Robert has a big problem with people. All people. When he becomes the unlikely custodian of a magical goldfish and his misanthropic views are seriously challenged. Can a person be frustrated into being better? There's a lot of things I 'hate' in this world but this is not one of them. Delightful story. A bit of a slow star, but picks up very quickly. Great acting and enjoyable story. A personal story that makes you think about how events in our past shape how we approach situations today. Highly professionally told. A good story. A bit too much anger for me at times with struggle toward resolution. Always kept my attention. here's a refreshing breath of fresh air of a solo show. while it appears on the surface as a conventional memoir-based storytelling show, it cleverly shapeshifts into a fictional character study w/ smatterings of magic, fantasy, and sci-fi leanings. while the misanthropy, sarcasm, and extreme anti-social leanings of "robert" seem abrasive, it's deliciously intentional and only feeds the dark pitch black comedy. 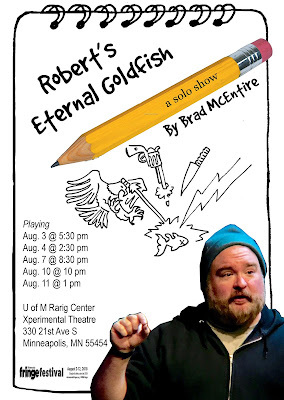 i'm recommending this show to everyone, and only wish there was a more..."theatrical" way to convey the goldfish & bowl to match the cleverness of the twisty-turny story, but come on, that's the minorest of criticisms. well done! Lots of anger in this one, especially in the beginning, but it is a nicely told story, and ends on a nice noted. Over the course of an hour, Brad McEntire takes us on the journey of a man trapped by his own anger. At times hilarious, frightening and insightful, McEntire balances the easy-going stylings of stand-up comedy with the intensity of an exorcism. Also, there's a cute cardboard goldfish! See it! I like misanthropic characters. Especially when their misanthropy is channeled into humorous tirades against the foolish conventions of society, or apoplectic fits over the seemingly trivial. While there is some of that to be seen and heard here, the "magical" aspect of the story and overall character development arc leads down a somewhat different path, which I personally both liked and disliked. 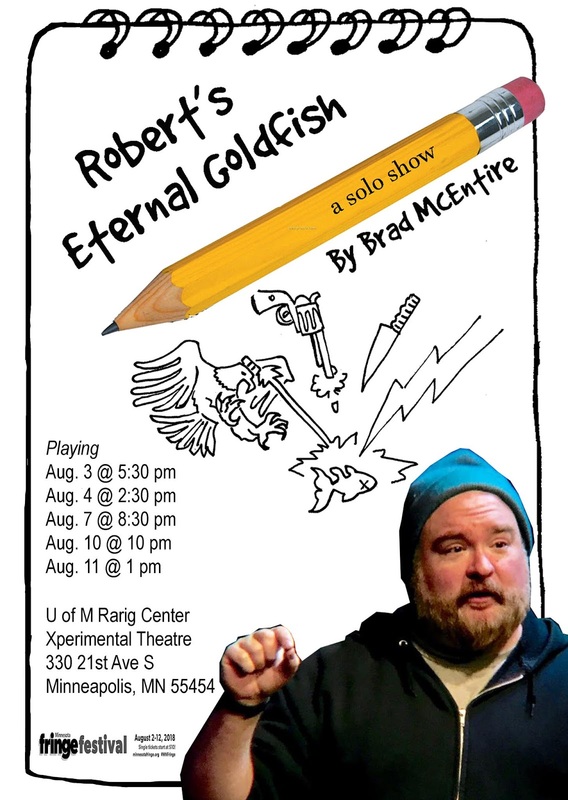 When I read a review that the character Robert is like a cross between George Costanza and Lewis Black, I developed certain false expectations about the performance prior to my attendance. My advice: shed any expectations and enjoy the character for who he is rather than for who you might want him to be. Overall, good performance but I did not find myself fully absorbed in the story. Initially, I was put off by the performer. He was a little too loud and too "in your face" for me. But he soon toned it down, the story progressed, and I warmed up to him. He creates a vivid character, initially mired in misanthropy and with a long and funny litany of things he hates. A chance encounter with a persistently friendly lady at a coffee shop leads to a string of strange events which gradually warm his cold, cold heart. This is a show worth seeing.
" Brad McEntire has crafted a tale of transformation and redemption... very absorbing..."